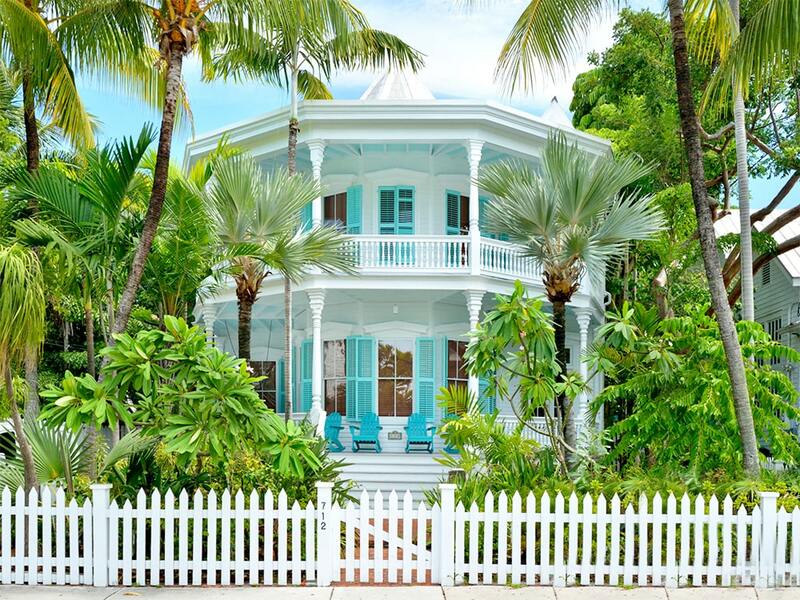 This one-of-a-kind Fantasy Resort Villa vacation rental perfectly blends two charming historic cottages right into a little bit of island heaven. 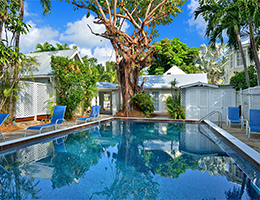 Your own private tropical resort is the feeling you get when you enter the bricked courtyard of this extraordinary property just off Upper Duval St. in Old Town Key West. 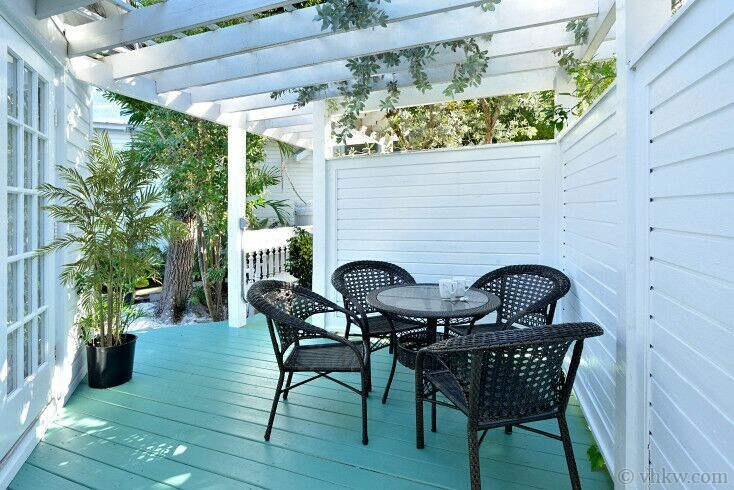 Featuring the perfect combination of two of the most requested and desirable historic vacation cottages in Old Town Key West, we are pleased to offer it as one of the more unique properties available in Old Town, a remarkable harmonization of our ever popular turn-of-the-century Vintage Luxury Cottage and the recently restored Caribbean Cottage. With 2 private swimming pools, beautifully landscaped bricked courtyard, two private sitting areas, two master bedrooms, a third bedroom, a den (which can serve as a 4th bedroom), a living room, two kitchens and two washers and dryers, this property offers the ideal setting for your family vacation. 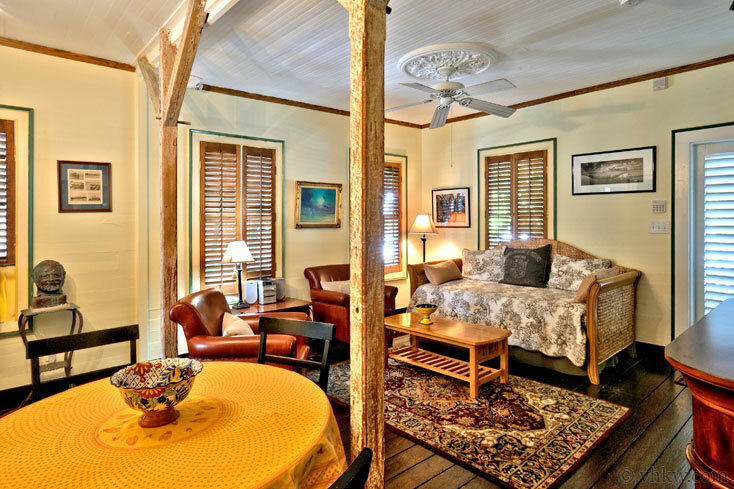 Because this is a blending of two cottages, sleeping accommodations are versatile, depending on whether you require 2 twin beds or a double bed for you additional sleeping needs. 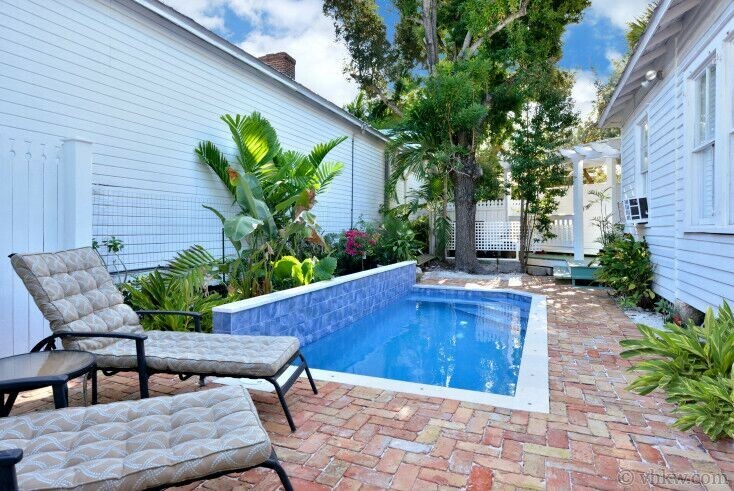 The private courtyard and swimming pool are well hidden just off Upper Duval St. The smaller cottage, also known as the Vintage Luxury Cottage, is an elegant one bedroom cottage that overlooks the swimming pool and courtyard. The interior of this cottage is made to feel spacious with open beamed ceilings, and is decorated and appointed with casual elegance. Tiled throughout with beautiful muted tile, the kitchen is a cooks dream stainless steel appliances, granite counter tops, and even a professional wine cooler under the counter. French doors open from the kitchen living room area to a large outdoor porch with a wrought iron table and chairs. Bedding for the cottage is a king size bed in the bedroom and two twin sleeper sofas in the living room. 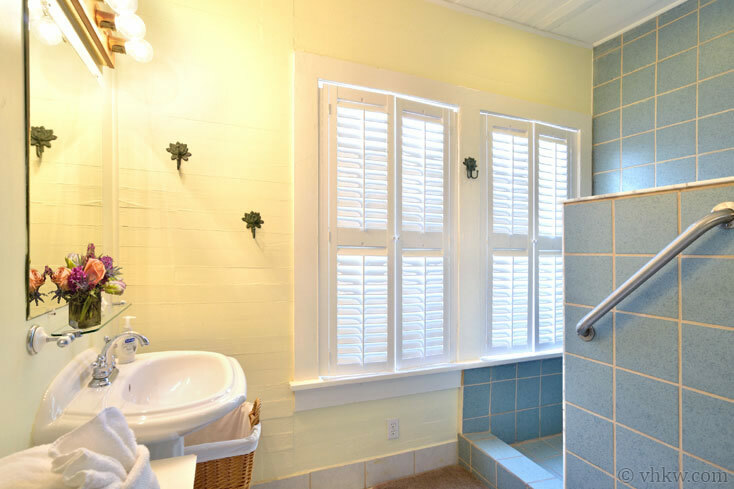 The bathroom offers a large custom tiled shower, and designer bath fixtures. 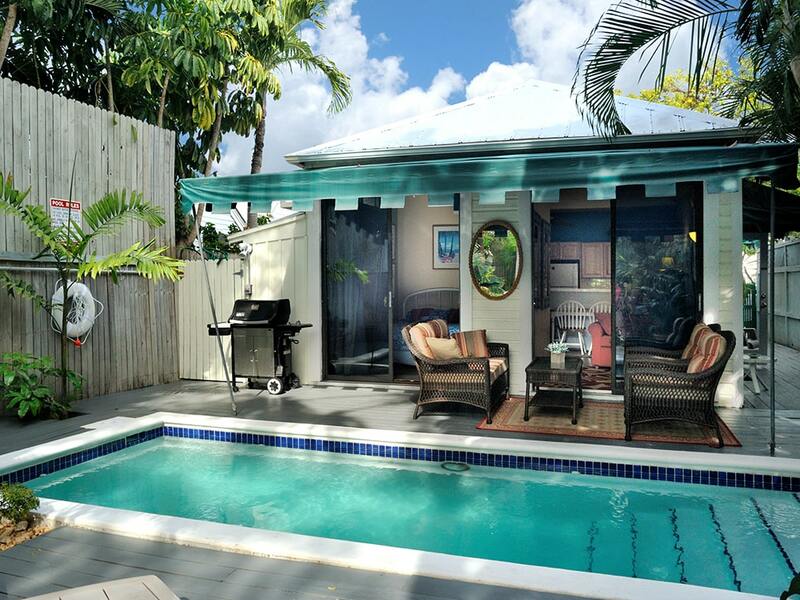 Stroll across the courtyard past the pool to a lattice fence gateway that leads to an entrance of the Caribbean Cottage. 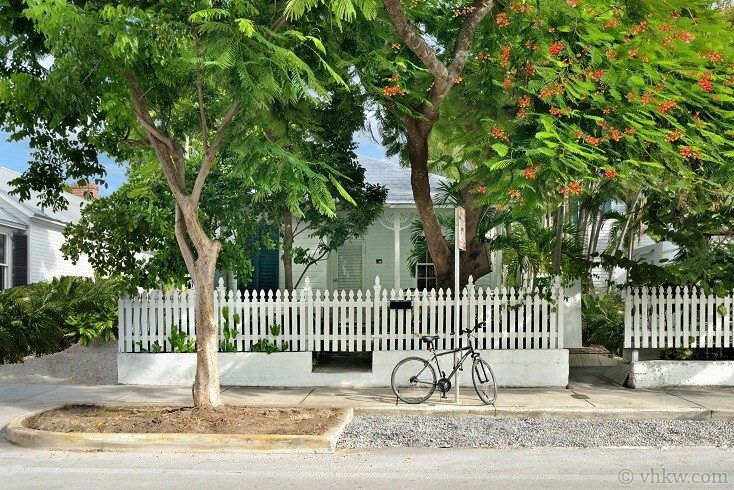 This cottage is recently restored and has an authentic Caribbean feel, with original wood planked polished floors, vintage hand-hewned beams, bright blue tile (accented with marble), and Bahama style wooden window shutters. 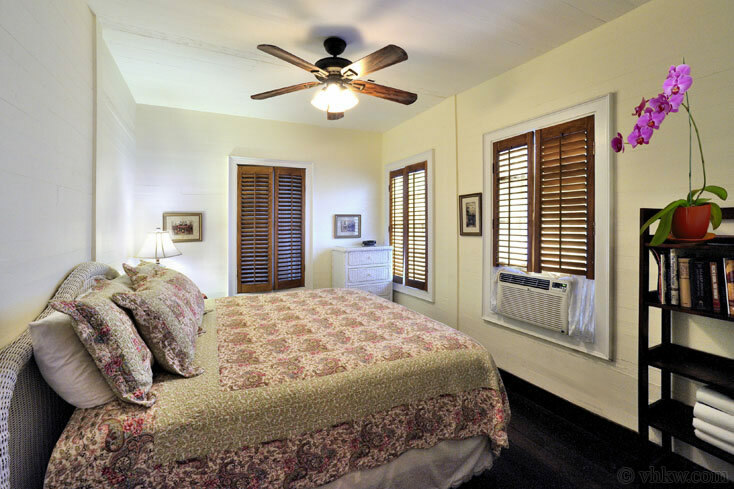 Artist owners painted the original pine walls with elegant historic colors of olive and cream, and adorned the sash style windows with wooden shutters and French linen curtains. Reserved for owner's use only for many years, original artwork from their private collection is displayed throughout for you to enjoy. cottage is believed to be one of the oldest cottages on the island. 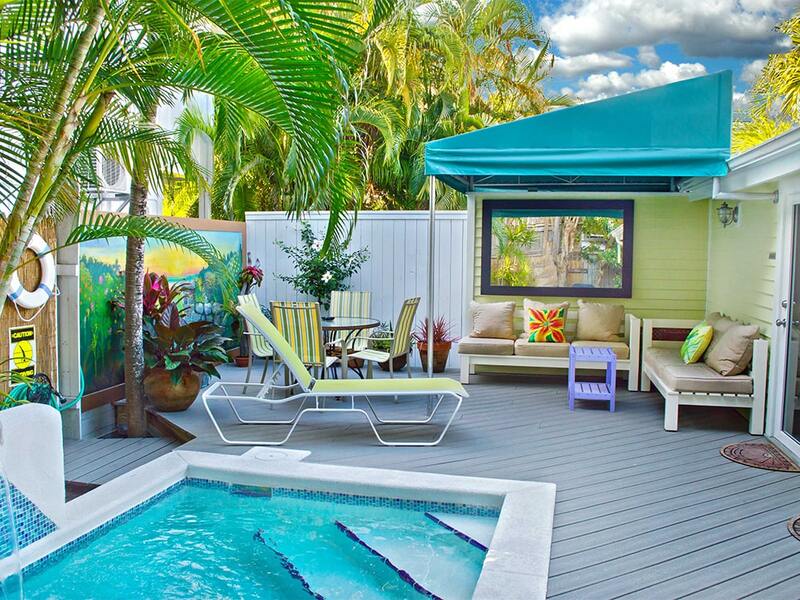 The private courtyard with heated pool creates an inviting private outdoor area set in a side yard of the Caribbean Cottage. The living room is a generous size, with plenty of room to gather. On the side closest to the kitchen, a dining table is placed to create a roomy eating area. 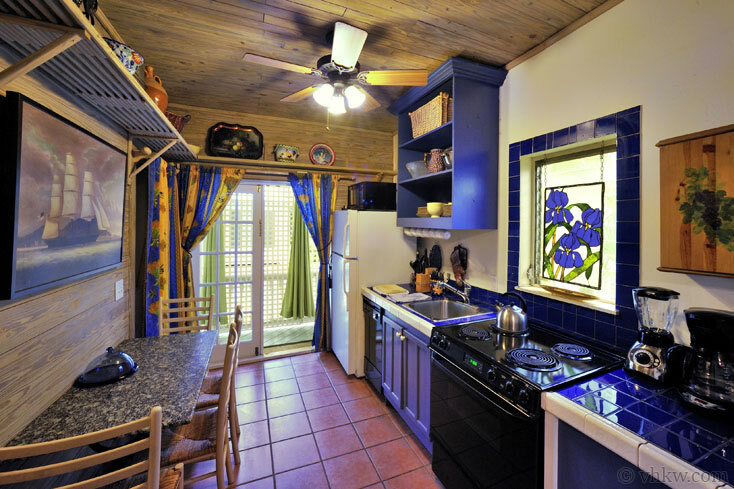 The adjoining "butler-pantry" style kitchen is spacious, has a charming French-Caribbean style ambiance, and is fully equipped and easy to cook in. The interior lay out of this cottage maximizes privacy with the bedrooms and bathrooms on one side and common living areas on the other. The cottage has two full bedrooms and two full bathrooms. Both bathrooms offer full baths with nice walk-in showers. Bedding in this cottage includes a king size bed in the master bedroom, and a queen size bed in the other. 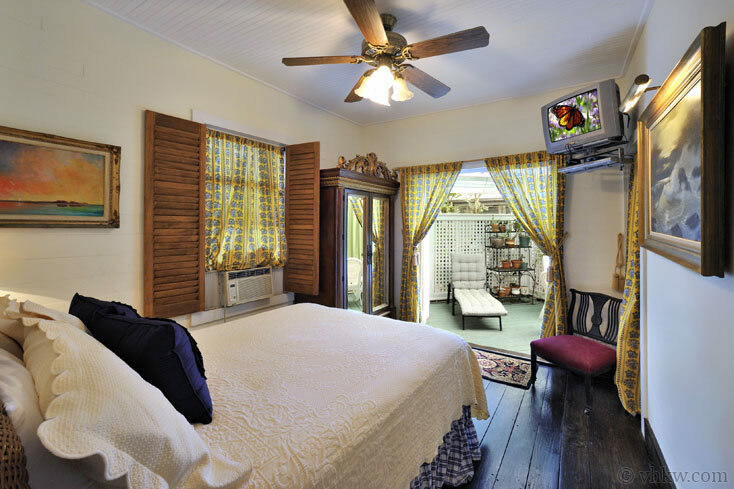 The master bedroom boasts a beautiful rich wooden armoire, and French doors lead from the bedroom to a pretty outdoor sitting area for reading and lounging. For extra sleeping, the living room has a comfortable twin daybed. The design of this fantasy villa makes it ideal for family groups or groups of friends. The courtyard-style plan provides two private cottages which are adjoined with a spacious outdoor living room for all to gather. It should be considered as an ideal location for a wedding party to reside, but not to stage the wedding. At the same time, the intimacy created by the Vintage Luxury Cottage make this unique home a wonderful location for a couple or a smaller group who want privacy and room to spread out. Ideal set up for wedding couple with up to six guests. 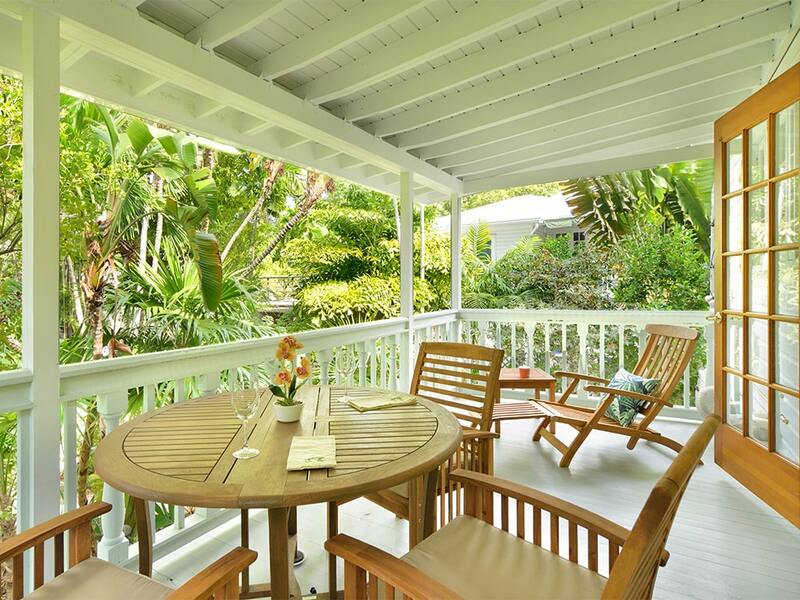 Bride and Groom have complete privacy in the Vintage Luxury Cottage, while the family or friends have the Caribbean Cottage. Special Feature: The couple who own this unique property are world travelers, long-time Key West residents, and popular purveyors of the Grand Vin wine tasting shop and award winning Flamingo Crossing home made ice cream store. Since both of these stores are close to the property you will cherish walking out the door for a glass or a scoop of your favorite taste. Amenities: Champagne for the newly weds! Swimming pool (heat optional) with brick courtyard, garden and deck, large front porch, fenced yard, fully equipped "cook's dream" kitchen with all new stainless steel appliances, professional wine cellar, and granite counter tops, second butler's pantry kitchen, A/C, 2 washers / 2 dryers, Flat screen color cable TV's, 2 outdoor gas grills, C/D player and stereo. Linens and towels provided, off-street parking for 2 cars. Activities: Right out your gate find Grand Vin Wine Bar, where you’ll enjoy a broad selection of wine by the glass and Flamingo Crossing, the award winning homemade ice cream store with some of the best ice cream you’ll ever eat. Shopping, boutique stores, art galleries, award winning and famous restaurants, bakeries, coffee shops, jazz clubs, museums, theatre, night life are close by. Enjoy family activities including, sailing, boating, snorkeling, diving. South Beach is down the street. Everything is within walking distance. Leave your car at home. 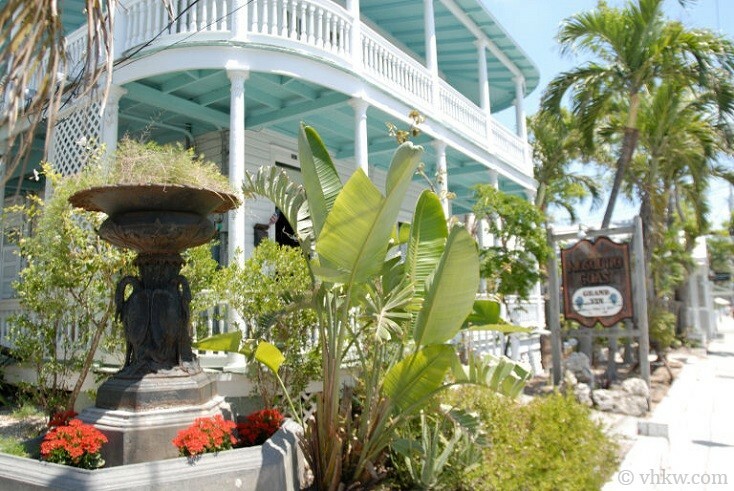 Area: A "best kept Key West secret!" 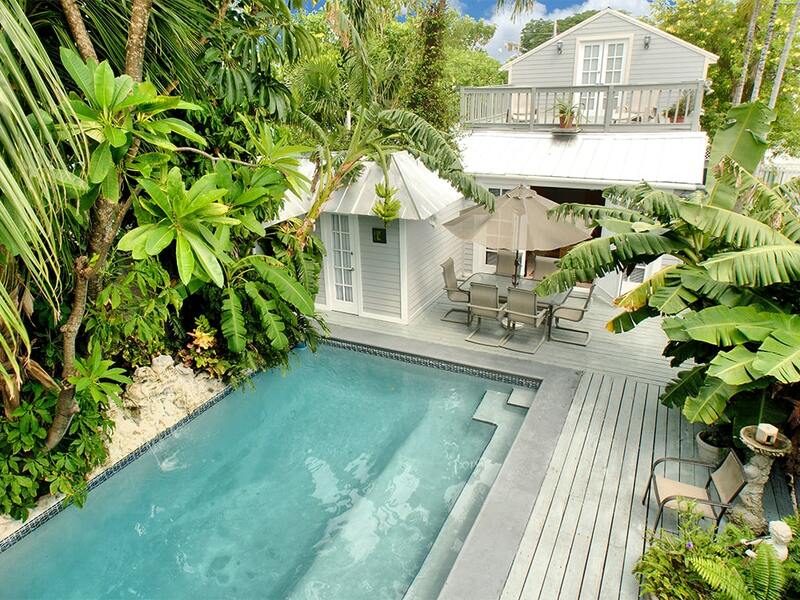 You would never know this unique courtyard property is here from the street. Elegant Upper Duval St. From here you really never need to get in your car. 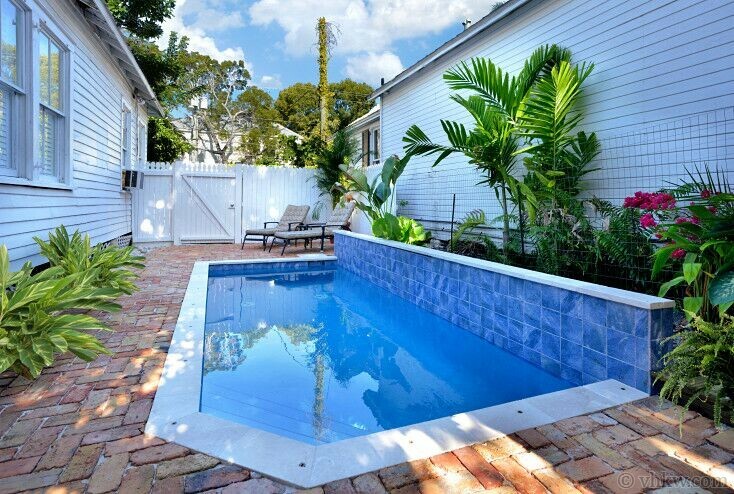 Enjoy walking or biking everywhere then return home for a dip in your private pool. 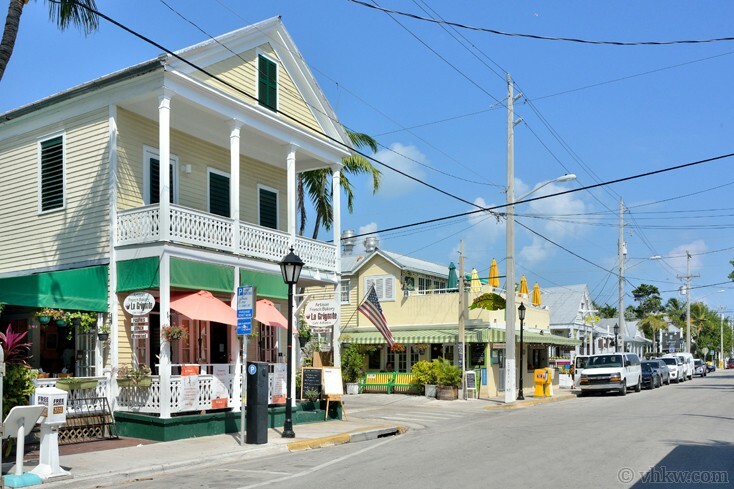 Located in the Upper Duval or ‘Uptown Key West’ which has evolved into the “elegant end of Duval” and offers an exceptional variety of restaurants, beautiful boutiques, and art galleries. 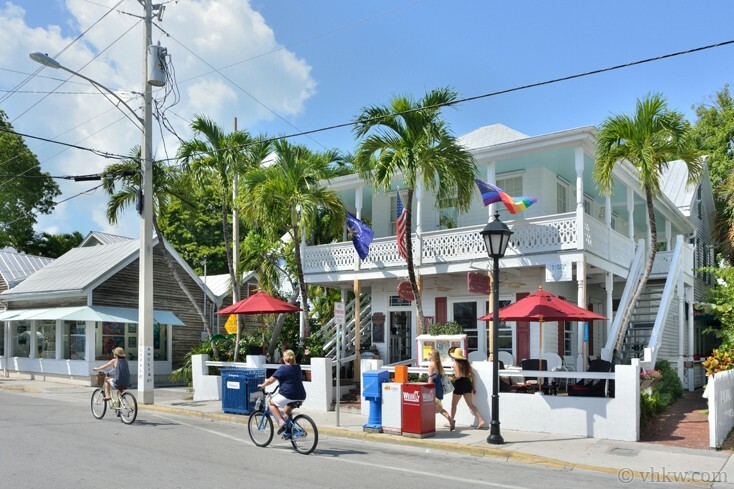 South Beach is just down Duval Street and the Southernmost Point of the United States is just around the corner. 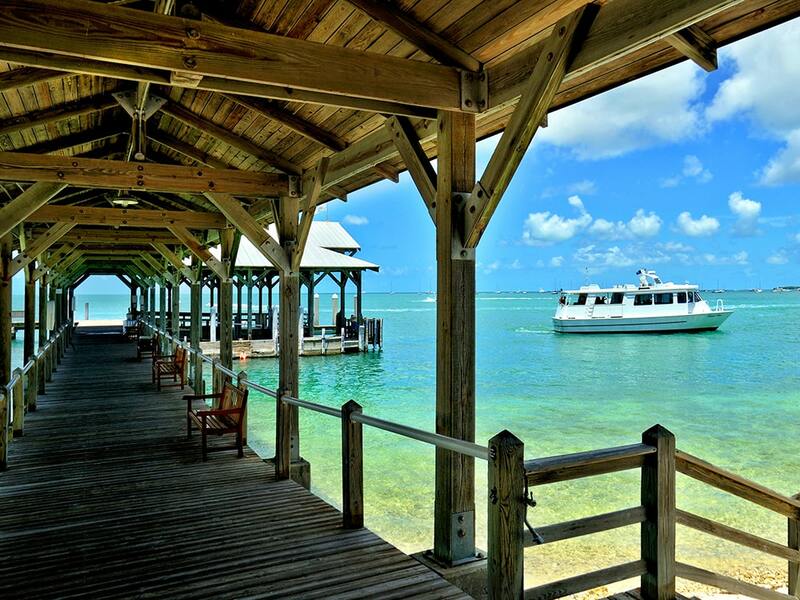 Walk to the Mallory Square Sunset Celebration in 10 to 15 minutes. 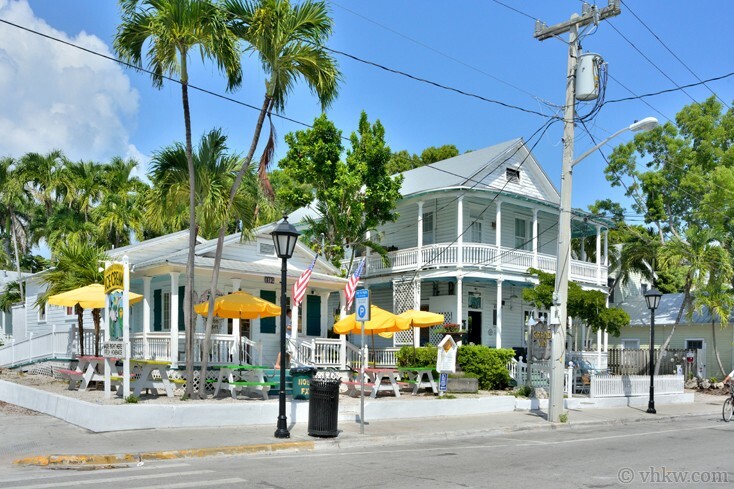 Parking: A rare feature of this amazing property is two off street parking spaces; something not often found in Old Town Key West. However, once you arrive, park your cars and forget about them as you can walk or bicycle everywhere. Restrictions: Smoking permitted on outside porches and pool deck only. No pets, please. We do not accept guests less than 25 years of age unless accompanied by a family group or guardian. Apr 20, 2019 - May 26, 2019 $5100 $875 4 night min. or 3 night min. 60 days prior to arrival. May 27, 2019 - Jun 14, 2019 $4575 $875 4 night min. or 3 night min. 60 days prior to arrival. Aug 9, 2019 - Oct 19, 2019 $4575 $875 4 night min. or 3 night min. 60 days prior to arrival. Oct 27, 2019 - Nov 3, 2019 $4575 $875 4 night min. or 3 night min. 60 days prior to arrival. Nov 11, 2019 - Nov 22, 2019 $4575 $875 4 night min. or 3 night min. 60 days prior to arrival. Nov 30, 2019 - Dec 20, 2019 $3850 $875 4 night min. or 3 night min. 60 days prior to arrival. Jan 4, 2020 - Jan 10, 2020 $5025 $1000 4 night min. or 3 night min. 60 days prior to arrival. Jan 11, 2020 - Jan 17, 2020 $5025 $1000 4 night min. or 3 night min. 60 days prior to arrival. Jan 18, 2020 - Jan 24, 2020 $5325 $1000 4 night min. or 3 night min. 60 days prior to arrival. Apr 18, 2020 - May 24, 2020 $5100 $875 4 night min. or 3 night min. 60 days prior to arrival. May 25, 2020 - Jun 12, 2020 $4675 $875 4 night min. or 3 night min. 60 days prior to arrival. Aug 8, 2020 - Oct 22, 2020 $4675 $875 4 night min. or 3 night min. 60 days prior to arrival. Nov 1, 2020 - Nov 7, 2020 $4675 $875 4 night min. or 3 night min. 60 days prior to arrival. Nov 16, 2020 - Nov 19, 2020 $4675 $875 4 night min. or 3 night min. 60 days prior to arrival. 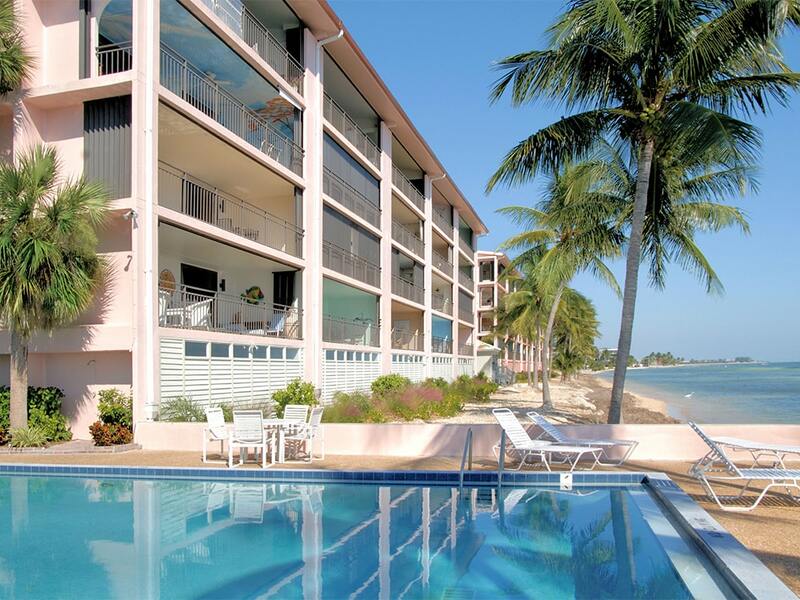 Nov 29, 2020 - Dec 18, 2020 $3950 $875 4 night min. or 3 night min. 60 days prior to arrival. High Season generally requires a 7 night minimum stay. Shorter stays of 3 - 5 nights may be available within 60 days of your arrival date or in special situations. Certain dates may not be available if they minimize optimal booking for the property's reservation calendar. Please contact us to inquire about stays less than 7 nights. Shoulder and Low Season is a 3 - 5 night minimum available on reservations made within 60 days of arrival May through mid-August. 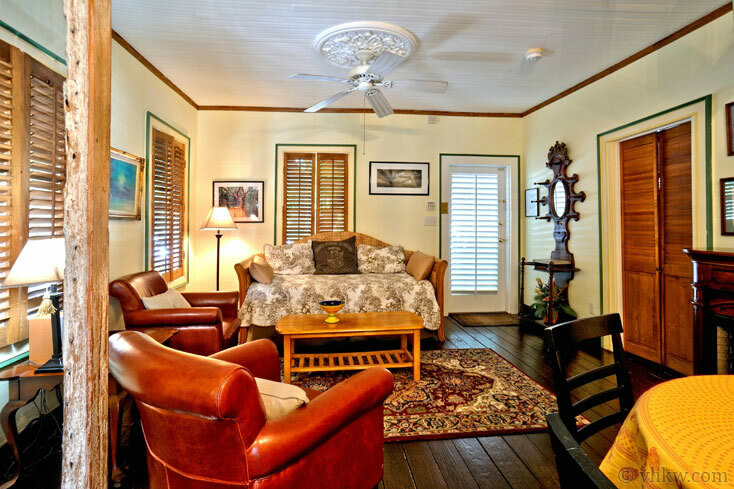 From mid-August through mid-December, 3 - 5 night minimum stays are available any time. Short Stays are available if there are open nights that are less than the minimum stay, shorter stays may be possible depending on the property. Please contact us to inquire. Holiday, Festival, and Event Rates are 20% to 25% higher. These include, but are not limited to: Fantasy Fest, New Years, Key West Yacht Race Week, Thanksgiving, Power Boat Races, Mini-Lobster Season, Labor Day, Parrot Heads Meeting of the Mind, Biker's Poker Run, 4th of July, Easter. A 7 night minimum stay is required for most major holidays, festivals, and events. Apply here for Travel Guard Trip Cancellation and Interruption Insurance. VHKW offers promotional specials for purchasing trip insurance for stays between Aug 10 and Oct 20. Please call for more details. * This property may not be available for the dates above due to other inquires and pending reservation. Please Note: Quick Quote rates and dates are an estimate and do not include discounts, holiday and event rates, or special fees pertaining to particular properties. In some cases, dates shown as booked, may still be available. Please contact us directly to confirm rates and availability using our inquiry form, or feel free to call us at (305)294-7358 ext 1. Rates, terms, and availability subject to change without notice.